Earthquake prediction is the ultimate goal of seismologists. Being able to predict when and where an earthquake will occur could save thousands, if not hundreds of thousands, of lives, over the years. Even after decades of study, earthquake forecasting remains notoriously difficult, however. So what are the signs which occur before an earthquake – earthquake precursors – and how useful are they? 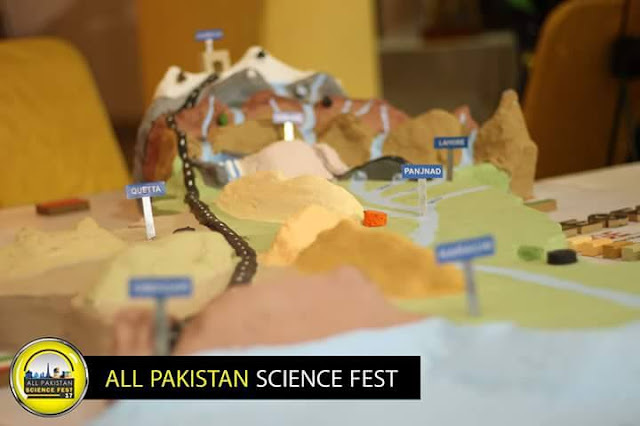 About the author (who writes this article): Nusrat Kamal Siddiqui is one of the leading Geoscientists from Pakistan. He has a diverse professional career of being a Petroleum Geologist, Hydrologist and Engineering Geologist, both in Pakistan and overseas. He recently published a book " Petroleum Geology, Basin Architecture and Stratigraphy of Pakistan". Click here for further details about the book. 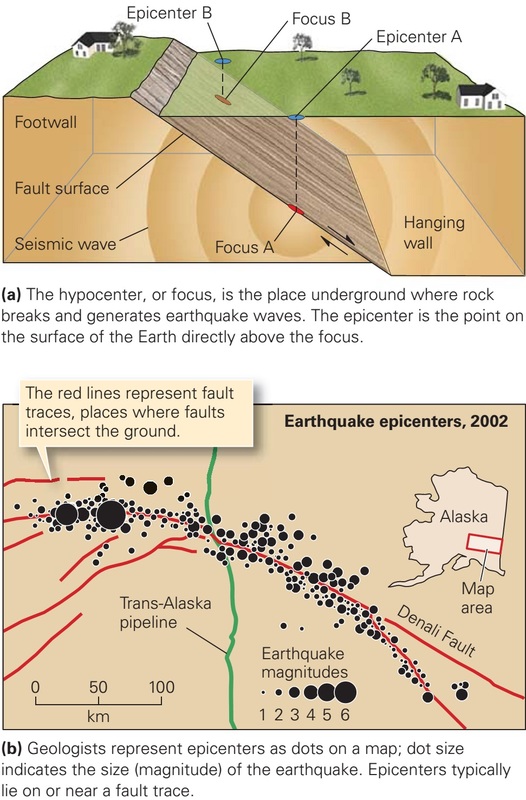 There are some long-term, medium-term and short-term precursors of seismic activity that cause earthquakes. The long-term precursors are based on statistical studies and the prediction is probabilistic. The medium-term precursors help in predicting the location of an earthquake to a sufficient degree of accuracy. The short-term precursors of seismic events are indicated by changes in geomagnetic field, changes in gravity field, rising of subsurface temperature and rise in ground radioactivity. Agriculture institutions record subsurface temperature at 20, 50 and 100 cm depth as it is useful for monitoring crop growth. 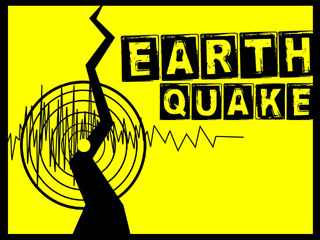 In earthquake-prone areas the temperature starts rising about 700-900 days before the event. This readily available data can be of help. The short-term precursors are more important as they can be observed by a common man, and happen from a few days before the earthquake to just before it happens. With a reducing lag time these are: rise in water in the wells with increased sediments, sudden increase and decrease in river water flow, disturbance in the reception of radio, television, telephones, water fountains on the high grounds, strange behavior of animals, a sudden jump in the number of deliveries in hospitals and malfunctioning of cell phones. These days cell phones are the most handy and common piece of electronic equipment. A general collapse of this system can be noted by masses, and hence could be a very effective means to take timely mitigation measure. It has been found that about 100 to 150 minutes before the earthquake the cell phones start malfunctioning. However, the humans are very careless by nature and there would be only very few who would be observant enough to note the above precursors. In the earthquake-prone areas groups of observant and responsible people (including women - they normally haul the water) may be constituted wherein the list of precursors, in local languages, may be distributed and some training imparted. And this exercise may not be left to the authorities, for obvious reasons! Sulphidic (or euxinic) conditions, which exist today in many water bodies from ponds to various land-surrounded mediterranean seas such as the Black Sea, were particularly prevalent in the Cretaceous Atlantic but also characterised other parts of the world ocean. In an ice-free sea of these supposed super-greenhouse worlds, oceanic waters were as much as 200 meters higher, in some eras. During the time spans in question, the continental plates are believed to have been well separated, and the mountains we know today were (mostly) future tectonic events meaning the overall landscapes were generally much lower and even the half super-greenhouse climates would have been eras of highly expedited water erosion carrying massive amounts of nutrients into the world oceans fuelling an overall explosive population of microorganisms and their predator species in the oxygenated upper layers. Detailed stratigraphic studies of Cretaceous black shales from many parts of the world have indicated that two oceanic anoxic events (OAEs) were particularly significant in terms of their impact on the chemistry of the oceans, one in the early Aptian (~120 Ma), sometimes called the Selli Event (or OAE 1a) after the Italian geologist, Raimondo Selli (1916–1983), and another at the Cenomanian-Turonian boundary (~93 Ma), sometimes called the Bonarelli Event (or OAE 2) after the Italian geologist, Guido Bonarelli (1871–1951). OAE1a lasted for ~1.0 to 1.3 Myr. The duration of OAE2 is estimated to be ~820 kyr based on a high-resolution study of the significantly expanded OAE2 interval in southern Tibet, China. 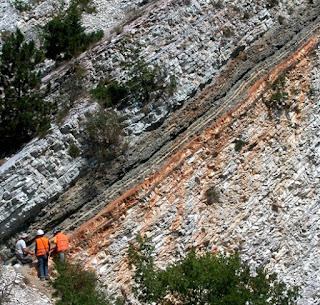 Insofar as the Cretaceous OAEs can be represented by type localities, it is the striking outcrops of laminated black shale within the various coloured clay-stones and pink and white limestone near the town of Gubbio in the Italian Apennines that are the best candidates. The 1-meter thick black shale at the Cenomanian-Turonian boundary that crops out near Gubbio is termed the ‘Livello Bonarelli’ after the man who first described it in 1891. More minor oceanic anoxic events have been proposed for other intervals in the Cretaceous (in the Valanginian, Hauterivian, Albian and Coniacian–Santonian stages), but their sedimentary record, as represented by organic-rich black shales, appears more parochial, being dominantly represented in the Atlantic and neighbouring areas, and some researchers relate them to particular local conditions rather than being forced by global change. The only oceanic anoxic event documented from the Jurassic took place during the early Toarcian (~183 Ma). Because no DSDP (Deep Sea Drilling Project) or ODP (Ocean Drilling Program) cores have recovered black shales of this age there being little or no Toarcian ocean crust remaining in the world ocean the samples of black shale primarily come from outcrops on land. 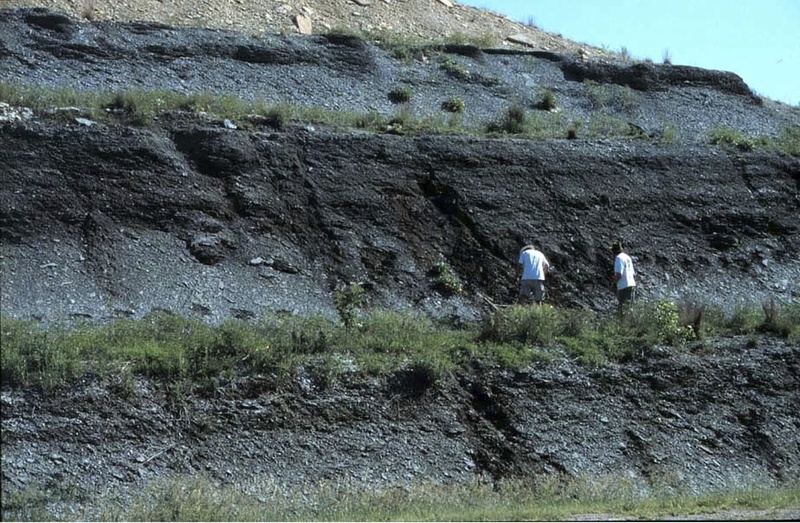 These outcrops, together with material from some commercial oil wells, are found on all major continents and this event seems similar in kind to the two major Cretaceous examples. The boundary between the Ordovician and Silurian periods is marked by repetitive periods of anoxia, interspersed with normal, oxic conditions. In addition, anoxic periods are found during the Silurian. These anoxic periods occurred at a time of low global temperatures (although CO2 levels were high), in the midst of a glaciation. Jeppsson (1990) proposes a mechanism whereby the temperature of polar waters determines the site of formation of downwelling water. If the high latitude waters are below 5 °C (41 °F), they will be dense enough to sink; as they are cool, oxygen is highly soluble in their waters, and the deep ocean will be oxygenated. If high latitude waters are warmer than 5 °C (41 °F), their density is too low for them to sink below the cooler deep waters. Therefore, thermohaline circulation can only be driven by salt-increased density, which tends to form in warm waters where evaporation is high. This warm water can dissolve less oxygen, and is produced in smaller quantities, producing a sluggish circulation with little deep water oxygen. The effect of this warm water propagates through the ocean, and reduces the amount of CO2 that the oceans can hold in solution, which makes the oceans release large quantities of CO2 into the atmosphere in a geologically short time (tens or thousands of years). The warm waters also initiate the release of clathrates, which further increases atmospheric temperature and basin anoxia. Similar positive feedback operate during cold-pole episodes, amplifying their cooling effects. The periods with cold poles are termed "P-episodes" (short for primo), and are characterised by bioturbated deep oceans, a humid equator and higher weathering rates, and terminated by extinction events for example, the Ireviken and Lau events. The inverse is true for the warmer, oxic "S-episodes" (secundo), where deep ocean sediments are typically graptolitic black shales. A typical cycle of secundo-primo episodes and ensuing event typically lasts around 3 Ma. The duration of events is so long compared to their onset because the positive feedback must be overwhelmed. Carbon content in the ocean-atmosphere system is affected by changes in weathering rates, which in turn is dominantly controlled by rainfall. Because this is inversely related to temperature in Silurian times, carbon is gradually drawn down during warm (high CO2) S-episodes, while the reverse is true during P-episodes. On top of this gradual trend is overprinted the signal of Milankovic cycles, which ultimately trigger the switch between P- and S- episodes. These events become longer during the Devonian; the enlarging land plant biota probably acted as a large buffer to carbon dioxide concentrations. The end-Ordovician Hirnantian event may alternatively be a result of algal blooms, caused by sudden supply of nutrients through wind-driven upwelling or an influx of nutrient-rich meltwater from melting glaciers, which by virtue of its fresh nature would also slow down oceanic circulation. Throughout most of Earth's history, it was thought that oceans were largely oxygen-deficient. During the Archean, euxinia was largely absent because of low availability of sulphate in the oceans, but during the Proterozoic, it would become more common. Oceanic anoxic events have had many important consequences. It is believed that they have been responsible for mass extinctions of marine organisms both in the Paleozoic and Mesozoic. The early Toarcian and Cenomanian-Turonian anoxic events correlate with the Toarcian and Cenomanian-Turonian extinction events of mostly marine life forms. Apart from possible atmospheric effects, many deeper-dwelling marine organisms could not adapt to an ocean where oxygen penetrated only the surface layers. An economically significant consequence of oceanic anoxic events is the fact that the prevailing conditions in so many Mesozoic oceans has helped produce most of the world's petroleum and natural gas reserves. During an oceanic anoxic event, the accumulation and preservation of organic matter was much greater than normal, allowing the generation of potential petroleum source rocks in many environments across the globe. 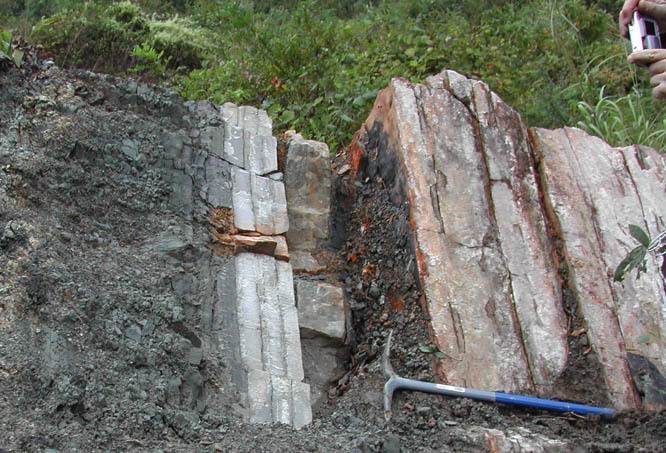 Consequently, some 70 percent of oil source rocks are Mesozoic in age, and another 15 percent date from the warm Paleogene: only rarely in colder periods were conditions favourable for the production of source rocks on anything other than a local scale. A model put forward by Lee Kump, Alexander Pavlov and Michael Arthur in 2005 suggests that oceanic anoxic events may have been characterised by up-welling of water rich in highly toxic hydrogen sulphide gas, which was then released into the atmosphere. 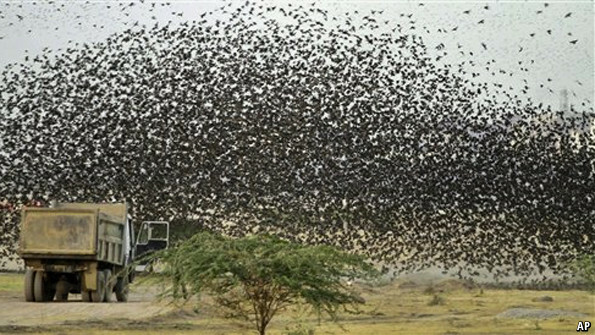 This phenomenon would probably have poisoned plants and animals and caused mass extinctions. Furthermore, it has been proposed that the hydrogen sulphide rose to the upper atmosphere and attacked the ozone layer, which normally blocks the deadly ultraviolet radiation of the Sun. The increased UV radiation caused by this ozone depletion would have amplified the destruction of plant and animal life. Fossil spores from strata recording the Permian-Triassic extinction event show deformities consistent with UV radiation. This evidence, combined with fossil biomarkers of green sulphur bacteria, indicates that this process could have played a role in that mass extinction event, and possibly other extinction events. The trigger for these mass extinctions appears to be a warming of the ocean caused by a rise of carbon dioxide levels to about 1000 parts per million. Reduced oxygen levels are expected to lead to increased seawater concentrations of redox-sensitive metals. The reductive dissolution of iron-manganese oxyhydroxides in seafloor sediments under low-oxygen conditions would release those metals and associated trace metals. Sulphate reduction in such sediments could release other metals such as barium. When heavy-metal-rich anoxic deep water entered continental shelves and encountered increased O2 levels, precipitation of some of the metals, as well as poisoning of the local biota, would have occurred. In the late Silurian mid-Pridoli event, increases are seen in the Fe, Cu, As, Al, Pb, Ba, Mo and Mn levels in shallow-water sediment and microplankton; this is associated with a marked increase in the malformation rate in chitinozoans and other microplankton types, likely due to metal toxicity. Similar metal enrichment has been reported in sediments from the mid-Silurian Ireviken event. What is Oceanic Anoxic Event? Oceanic anoxic event or anoxic event (anoxic conditions) allude to interims in the Earth's past where parts of seas get to be distinctly exhausted in oxygen (O2) at profundities over a substantial geographic region. Amid some of these occasions, euxinia, waters that contained H2S hydrogen sulphide, developed. Although anoxic event have not occurred for a huge number of years, the land record demonstrates that they happened commonly previously. 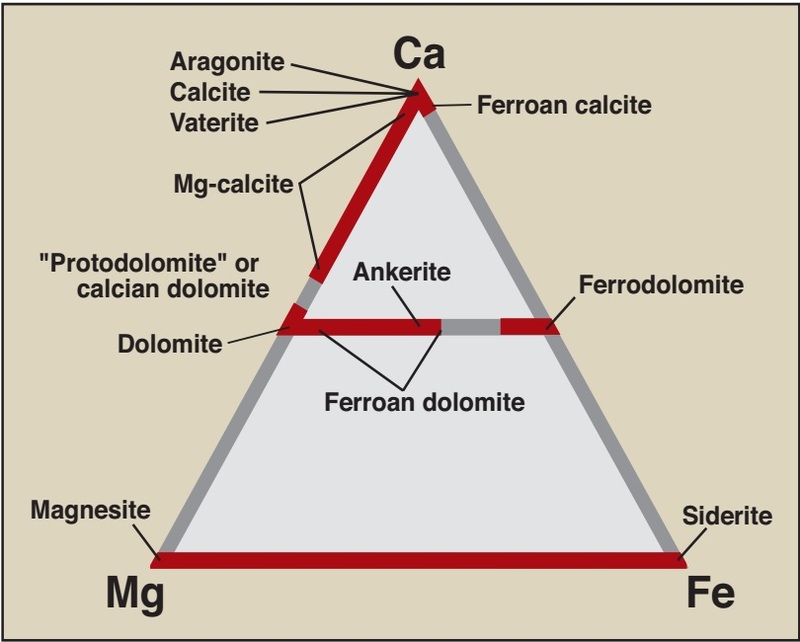 Anoxic event harmonised with a few mass eradications and may have added to them. These mass eliminations incorporate some that geobiologists use as time markers in biostratigraphic dating. Many geologists trust maritime anoxic event are unequivocally connected to abating of sea flow, climatic warming, and lifted levels of nursery gasses. Scientists have proposed improved volcanism (the arrival of CO2) as the "focal outer trigger for euxinia". The concept of the oceanic anoxic event (OAE) was first proposed in 1976 by Seymour Schlanger (1927–1990) and geologist Hugh Jenkyns and arose from discoveries made by the Deep Sea Drilling Project (DSDP) in the Pacific Ocean. It was the finding of black carbon-rich shales in Cretaceous sediments that had accumulated on submarine volcanic plateaus (Shatsky Rise, Manihiki Plateau), coupled with the fact that they were identical in age with similar deposits cored from the Atlantic Ocean and known from outcrops in Europe - particularly in the geological record of the otherwise limestone-dominated Apennines chain in Italy - that led to the realisation that these widespread similar strata recorded highly unusual oxygen-depleted conditions in the world ocean during several discrete periods of geological time. 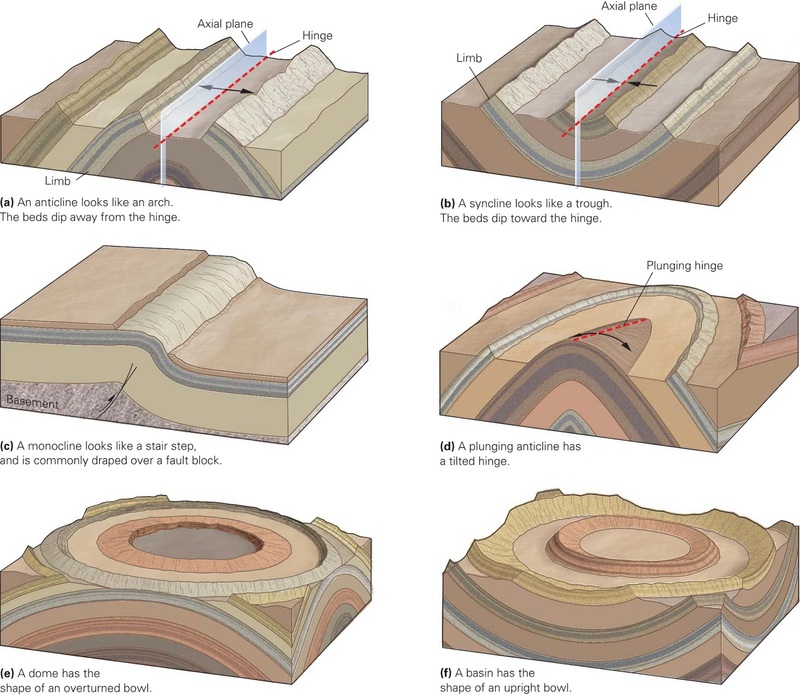 Sedimentological investigations of these organic-rich sediments, which have continued to this day, typically reveal the presence of fine laminations undisturbed by bottom-dwelling fauna, indicating anoxic conditions on the sea floor, believed to be coincident with a low lying poisonous layer of hydrogen sulphide. Furthermore, detailed organic geochemical studies have recently revealed the presence of molecules (so-called biomarkers) that derive from both purple sulphur bacteria and green sulphur bacteria: organisms that required both light and free hydrogen sulphide (H2S), illustrating that anoxic conditions extended high into the illuminated upper water column. There are currently several places on earth that are exhibiting the features of anoxic events on a localised scale such as algal/bacterial blooms and localised "dead zones". Dead zones exist off the East Coast of the United States in the Chesapeake Bay, in the Scandinavian strait Kattegat, the Black Sea (which may have been anoxic in its deepest levels for millennia, however), in the northern Adriatic as well as a dead zone off the coast of Louisiana. The current surge of jellyfish worldwide is sometimes regarded as the first stirrings of an anoxic event. Other marine dead zones have appeared in coastal waters of South America, China, Japan, and New Zealand. A 2008 study counted 405 dead zones worldwide. This is a recent understanding. This picture was only pieced together during the last three decades. The handful of known and suspected anoxic events have been tied geologically to large-scale production of the world's oil reserves in worldwide bands of black shale in the geologic record. Likewise the high relative temperatures believed linked to so called "super-greenhouse events". Oceanic anoxic events with euxinic (i.e. sulphide) conditions have been linked to extreme episodes of volcanic out-gassing. 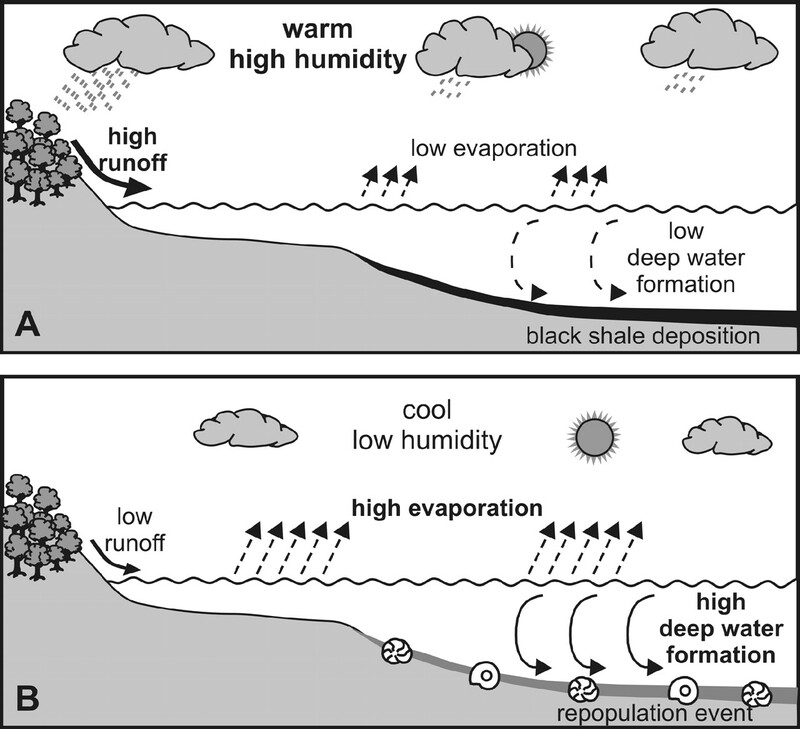 Thus, volcanism contributed to the buildup of CO2 in the atmosphere, increased global temperatures, causing an accelerated hydrological cycle that introduced nutrients to the oceans to stimulate planktonic productivity. These processes potentially acted as a trigger for euxinia in restricted basins where water-column stratification could develop. Under anoxic to euxinic conditions, oceanic phosphate is not retained in sediment and could hence be released and recycled, aiding continued high productivity. Temperatures throughout the Jurassic and Cretaceous are generally thought to have been relatively warm, and consequently dissolved oxygen levels in the ocean were lower than today making anoxia easier to achieve. However, more specific conditions are required to explain the short-period (less than a million years) oceanic anoxic events. Two hypotheses, and variations upon them, have proved most durable. 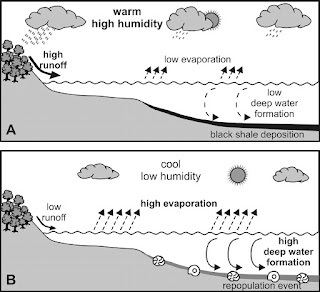 One hypothesis suggests that the anomalous accumulation of organic matter relates to its enhanced preservation under restricted and poorly oxygenated conditions, which themselves were a function of the particular geometry of the ocean basin: such a hypothesis, although readily applicable to the young and relatively narrow Cretaceous Atlantic (which could be likened to a large-scale Black Sea, only poorly connected to the World Ocean), fails to explain the occurrence of coeval black shales on open-ocean Pacific plateaus and shelf seas around the world. There are suggestions, again from the Atlantic, that a shift in oceanic circulation was responsible, where warm, salty waters at low latitudes became hypersaline and sank to form an intermediate layer, at 500 to 1,000 m (1,640 to 3,281 ft) depth, with a temperature of 20 °C (68 °F) to 25 °C (77 °F). The second hypothesis suggests that oceanic anoxic events record a major change in the fertility of the oceans that resulted in an increase in organic-walled plankton (including bacteria) at the expense of calcareous plankton such as coccoliths and foraminifera. Such an accelerated flux of organic matter would have expanded and intensified the oxygen minimum zone, further enhancing the amount of organic carbon entering the sedimentary record. Essentially this mechanism assumes a major increase in the availability of dissolved nutrients such as nitrate, phosphate and possibly iron to the phytoplankton population living in the illuminated layers of the oceans. For such an increase to occur would have required an accelerated influx of land-derived nutrients coupled with vigorous upwelling, requiring major climate change on a global scale. Geochemical data from oxygen-isotope ratios in carbonate sediments and fossils, and magnesium/calcium ratios in fossils, indicate that all major oceanic anoxic events were associated with thermal maxima, making it likely that global weathering rates, and nutrient flux to the oceans, were increased during these intervals. Indeed, the reduced solubility of oxygen would lead to phosphate release, further nourishing the ocean and fuelling high productivity, hence a high oxygen demand - sustaining the event through a positive feedback. Here is another way of looking at oceanic anoxic events. Assume that the earth releases a huge volume of carbon dioxide during an interval of intense volcanism; global temperatures rise due to the greenhouse effect; global weathering rates and fluvial nutrient flux increase; organic productivity in the oceans increases; organic-carbon burial in the oceans increases (OAE begins); carbon dioxide is drawn down due to both burial of organic matter and weathering of silicate rocks (inverse greenhouse effect); global temperatures fall, and the ocean–atmosphere system returns to equilibrium (OAE ends). In this way, an oceanic anoxic event can be viewed as the Earth’s response to the injection of excess carbon dioxide into the atmosphere and hydrosphere. One test of this notion is to look at the age of large igneous provinces (LIPs), the extrusion of which would presumably have been accompanied by rapid effusion of vast quantities of volcanogenic gases such as carbon dioxide. Intriguingly, the age of three LIPs (Karoo-Ferrar flood basalt, Caribbean large igneous province, Ontong Java Plateau) correlates uncannily well with that of the major Jurassic (early Toarcian) and Cretaceous (early Aptian and Cenomanian–Turonian) oceanic anoxic events, indicating that a causal link is feasible. Oceanic anoxic events most commonly occurred during periods of very warm climate characterised by high levels of carbon dioxide (CO2) and mean surface temperatures probably in excess of 25 °C (77 °F). The Quaternary levels, the current period, are just 13 °C (55 °F) in comparison. Such rises in carbon dioxide may have been in response to a great out-gassing of the highly flammable natural gas (methane) that some call an "oceanic burp". Vast quantities of methane are normally locked into the Earth's crust on the continental plateaus in one of the many deposits consisting of compounds of methane hydrate, a solid precipitated combination of methane and water much like ice. Because the methane hydrates are unstable, except at cool temperatures and high (deep) pressures, scientists have observed smaller "burps" due to tectonic events. Studies suggest the huge release of natural gas could be a major climatological trigger, methane itself being a greenhouse gas many times more powerful than carbon dioxide. However, anoxia was also rife during the Hirnantian (late Ordovician) ice age. Oceanic anoxic events have been recognised primarily from the already warm Cretaceous and Jurassic Periods, when numerous examples have been documented, but earlier examples have been suggested to have occurred in the late Triassic, Permian, Devonian (Kellwasser event), Ordovician and Cambrian. The Paleocene-Eocene Thermal Maximum (PETM), which was characterised by a global rise in temperature and deposition of organic-rich shales in some shelf seas, shows many similarities to oceanic anoxic events. Typically, oceanic anoxic events lasted for less than a million years, before a full recovery.